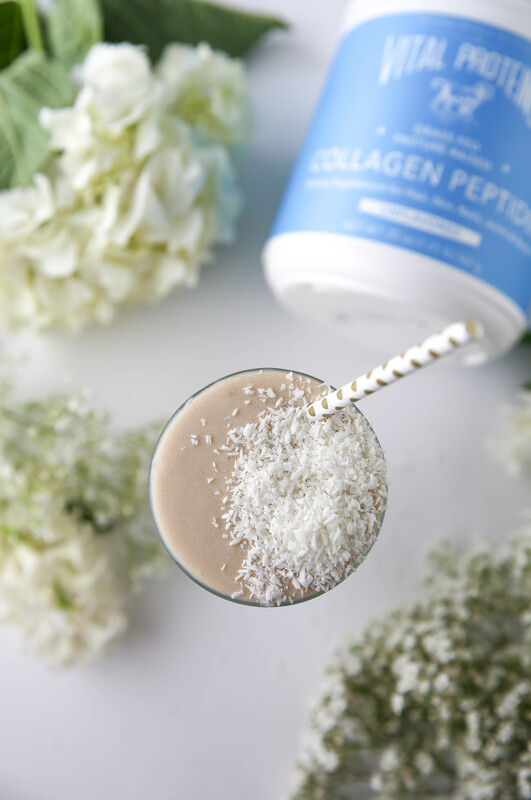 I’ve talked about collagen before on the blog, but it’s something I get questions about constantly because, well, I promote the crap out of it. I’m obsessed with it. And I’m not one to talk about supplements very often. I don’t take any pills or drink protein shakes after a workout. I just like to eat real food. But when I found out about all the benefits from collagen…mostly the beauty benefits…I gave it a try and was quickly hooked after a few months. It’s been about a year since I started adding collagen to my diet every single day and my skin, hair, and nails have never been better. Before I started taking collagen, my hair NEVER grew. It stayed the same length and even though I didn’t know it at the time, it was pretty unhealthy. But once I started adding collagen, a few months later my hair began to grow and become thicker. And the same goes with my nails. They grow SO FAST! But one of the main reasons I started to take collagen is because it helps out your skin as you age. And as you may know, I am ALL ABOUT doing whatever I need to do to help my skin age well. We naturally produce collagen but often not enough, especially as well get older. Which is why I do so many laser treatments on my skin to help rebuild and restore new collagen. And adding the collagen to my diet is just another added bonus to help with my skin’s moisture and elasticity…aka dat plump baby face. But if you’re not as vain as me, I promise you, collagen is still for you! Collagen helps with joint health, bone strength, healthy cartilage, it improves gut health and digestion and it can even help with sleep! So even if you’re not obsessed with the beauty benefits, how can you not be obsessed with the health benefits? And since it’s insanely easy to add into your daily routine, there is really no excuse to not try it out and see the benefits! Vital Proteins is a brand that you can rely on and trust to add into your daily routine. 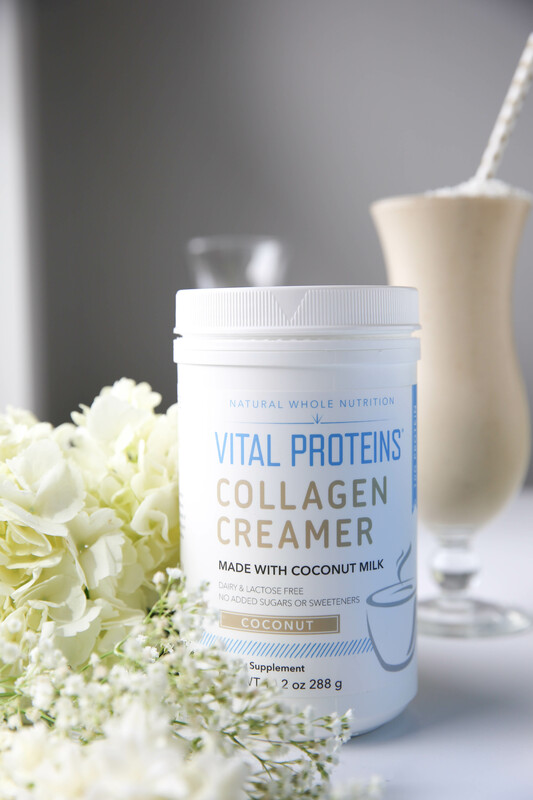 They source their collagen peptides from grass-fed, pasture-raised bovine hides from Brazil and their marine collagen is sourced from wild-caught, non-GMO Red Snapper off the coast of Hawaii! They use cattle from Brazil because the cattle industry in Brazil is still based on grass systems, where the cattle are pasture raised. Brazil also has a law which prohibits the addition of hormones to the feed. The hormone rBGH is typically injected into dairy cows to make them produce more milk, but the Nelore breed is not a dairy producing cow and is strictly used as a beef breed. And Vital Proteins makes sure that the cattle are taken care of and in alignment with the Global Animal Partnership 5-step animal welfare rating standards. So you know you are getting the best quality whenever you are purchasing a Vital Proteins product! 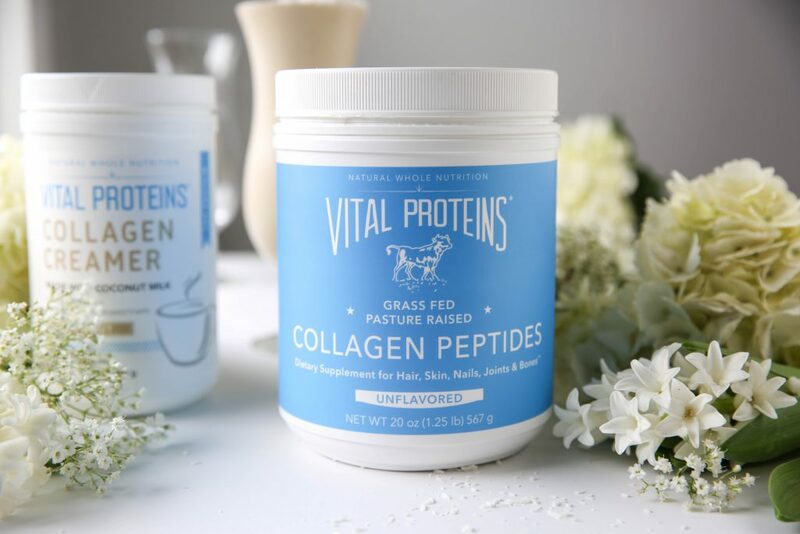 You’ve probably seen me talk about Vital Protein Unflavored Collagen Peptides on my instagram, blog and instagram stories because it’s my favorite product of theirs, but they have SO many different products to choose from nowadays! 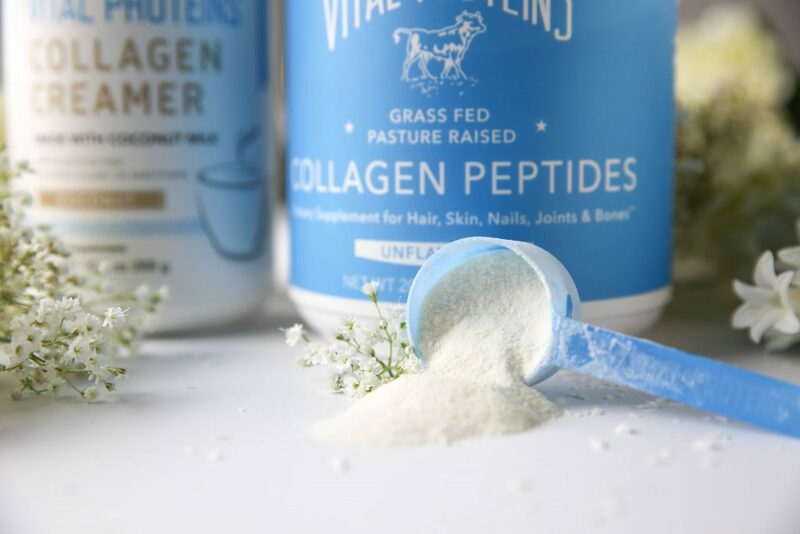 The Beef Collagen Peptides as well as the Marine Collagen Peptides are both unflavored and can be added to anything. Since I drink coffee every morning, I add a scoop or two of the Beef Collagen Peptides to my coffee, mix, then add a little heavy cream and stevia and it tastes exactly like my normal coffee! Now they even have Coconut Collagen Creamer now but I much prefer the unflavored Beef Collagen Peptides so I can make my coffee taste exactly how I want it to! Beauty Boost Capsules – If you don’t want to drink your collagen, just have it in pill form instead! Collagen has seriously been life changing for me. I even pack it with me on vacations to make sure it’s still part of my daily routine. And I’ll be packing it with me on my upcoming trip to the Caribbean on my catamaran vacation! Last time I went on that vacation, I was the first one up every morning to make my collagen coffee before I worked out and soaked up every bit of sunshine. 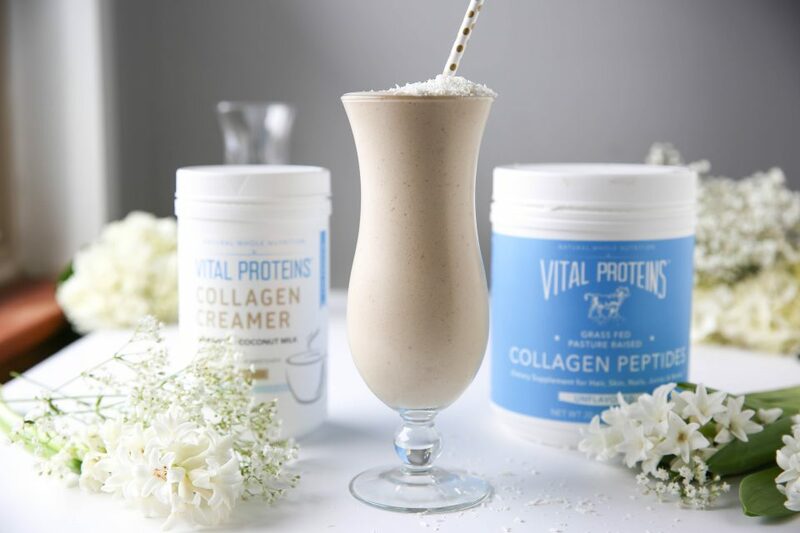 If you haven’t tried Vital Proteins yet, I highly recommend it! You’re going to love some of the changes you experience both inside and out! 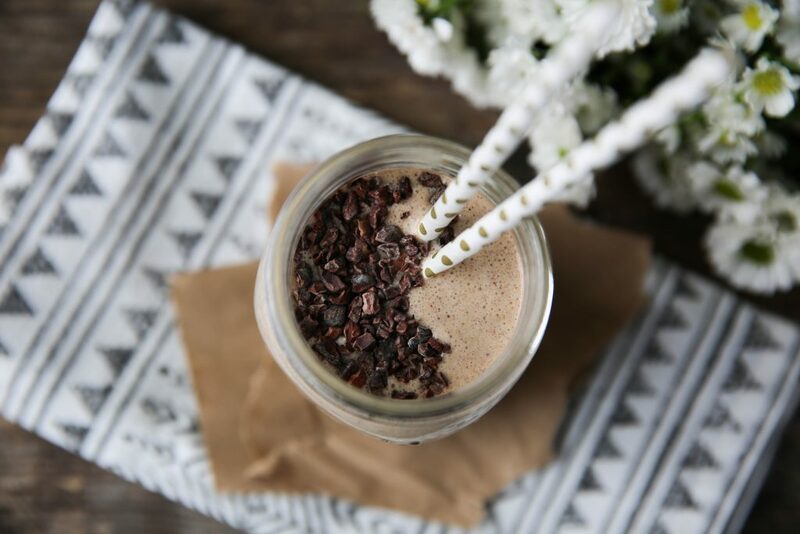 Place all ingredients in a blender and blend until smooth and completely combined. This post is brought to you by Vital Proteins, a product I regularly use in my household and love! I may be compensated through my affiliate links in this post, but all opinions are my own. This compensation helps with expenses to keep this blog up and running! Juli, I tried beef collagen once before and my mouth broke out in sores. I’m not sure why. Possibly too much arginine? Thank u. Love your blog & recipes. omg that’s crazy! i have no clue. i wonder if that would happen with the marine collagen? Speaking of hair…are you still running the Living Proof promotion? I put 1 T of collagen in my coffee each morning. I feel like it changes the flavor a bit if I add more than that, but I’ve gotten great results too! I am sooo curious to try the collagen creamer. What’d you honestly think of the creamer? Does it blend well? it blends super well, but i honestly just prefer the taste of my own coffee with heavy cream and stevia and have gotten comfortable with that so i just prefer the collagen peptides! Juli! 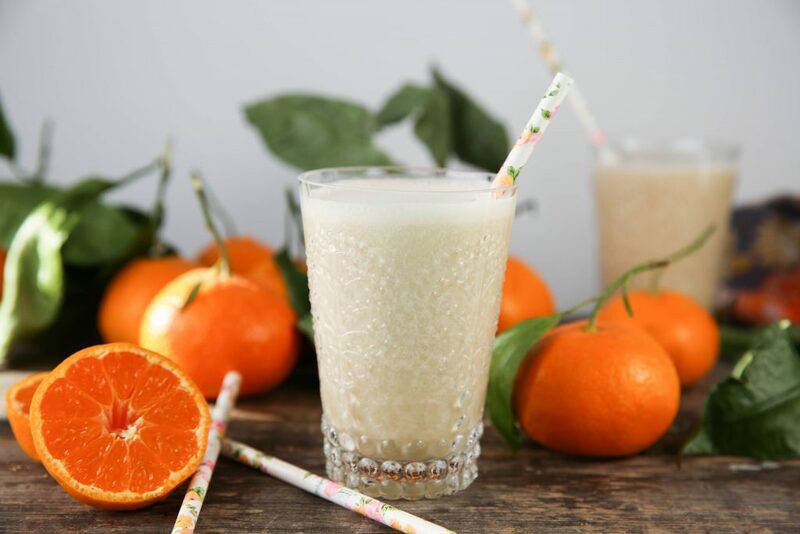 I’ve been waiting for this post because I’ve been thinking of trying collagen since whey protein makes my sensitive stomach unhappy! And better skin, hair and nails is a great benefit. I just got some vital proteins and was wondering how many scoops you have in a day? I’m starting with one twice a day to see how my stomach does, but might increase to two twice a day if no problems. Love your blog and sense of humor! i honestly just do a big ole heaping scoop of it, i don’t even do 2 full scoops and i only do that once a day most of the time. sometimes if i have a super hard workout, i’ll add in another heaping scoopful, but i seem to do great with just once a day! Nice- I might make this recipe hot with this surprise snow happening! Is the collagen heat sensitive? Like, can I put it in baked goods and other recipes that are cooked? Thank you for this recipe! It looks soooo coconutty d-lish! you can cook with collagen protein and it will not lose any nutritional quality! However, I am starting to wonder whether the collagen powder would be more effective for skin. You’ve used Great Lakes, Primal Fuel and Vital Proteins brand collagen. I’m not sure which one to purchase…which one is your favorite? i honestly love all of them! they are all great brands! so i would do your research and find what works for you, your needs and your budget! I just started using the collagen peptides a few months ago, on the suggestion of my doctor to use it for some additional protein first thing in the morning. I feel like it adds an extra little creamy note to my coffee which is yummy. I’m curious to see if I will detect any of the exciting beauty effects from using it. I’ve been cooking with bone broth for at least a decade now, and I always make sure there’s lots of joint material in there when I boil bones, so I suspect that I’m getting a good amount of collagen in my diet already. Do you have any idea how the collagen powder compares to a rich bone broth? Also, is there such thing as “too much” collagen? I have read that you can OD on bone broth because of the calcium content, so I’m hoping that adding just collagen won’t push me up to some kind of critical mass! I went out in a blizzard to pick up some collagen because of you! I cannot wait to see the benefits that collagen does to my body! I bought this collagen just because I noticed how long your hair got! Getting married in a year and I can’t wait to see a difference! Does this replace a protein powder? I drink a shake daily with greens, protein powder, almond milk and typically a 1/2 banana. I wanted to add this to the shake, but not sure if that is ok. Thanks. This was delicious! I didn’t have vanilla collagen so I used plain and just added a little extra vanilla extract. I also used a non-frozen banana and just added a little ice. Yummers! I LOVE Vital Proteins as well! I recently bought the Marine one though and when I added it to my coffee, it def tasted fishy…yuck. So now I have a huge container of it. Do you have any recommendations of how to use it besides in coffee or a smoothie? Those are my tried and true ways, but wondering if there’s another use/recipe since I can taste the fish too much. Thanks Juli! i found that the marine had even less taste than the beef so that’s surprise to me! you can also add it to soups, baked goods, other hot drinks, etc! This is my ALL time favourite smoothie. Love it sooo much its like a coconutty ice cream milkshake. Super rich and satisfying. Love your work! And I don’t use the coconut extract just cos I don’t have any and it’s already super coconutty flavour. so happy to hear you love it, brenda!